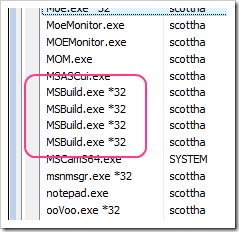 UPDATE: I've written an UPDATE on how to get MSBuild building using multiple cores from within Visual Studio. You might check that out when you're done here. Jeff asked the question "Should All Developers Have Manycore CPUs?" this week. There are number of things in his post I disagree with. First, "dual-core CPUs protect you from badly written software" is just a specious statement as it's the OS's job to protect you, it shouldn't matter how many cores there are. Second, "In my opinion, quad-core CPUs are still a waste of electricity unless you're putting them in a server" is also silly. Considering that modern CPUs slow down when not being used, and use minimal electricity when compared to your desk lamp and monitors, I can't see not buying the best (and most) processors) that I can afford. The same goes with memory. Buy as much as you can comfortably afford. No one ever regretted having more memory, a faster CPU and a large hard drive. Third he says,"there are only a handful of applications that can truly benefit from more than 2 CPU cores" but of course, if you're running a handful of applications, you can benefit even if they are not multi-threaded. Just yesterday I was rendering a DVD, watching Arrested Development, compiling an application, reading email while my system was being backed up by Home Server. This isn't an unreasonable amount of multitasking, IMHO, and this is why I have a quad-proc machine. That said, the limits to which a machine can multi-task are often limited to the bottleneck that sits between the chair and keyboard. Jeff, of course, must realize this, so I'm just taking issue with his phrasing more than anything. He does add the disclaimer, which is totally valid: "All I wanted to do here is encourage people to make an informed decision in selecting a CPU" and that can't be a bad thing. Now, enough picking on Jeff, let's talk about my reality as a .NET Developer and a concrete reason I care about multi-core CPUs. Jeff compiled SharpDevelop using 2 cores and said "I see nothing here that indicates any kind of possible managed code compilation time performance improvement from moving to more than 2 cores." You might wonder, why do we not just use one multithreaded process for MSBuild? Because each building project wants its own current directory (and potentially custom tasks expect this) and each PROCESS can only have one current directory, no matter how many threads exist. When you run MSBuild on a SLN (Solution File) (which is NOT an MSBuild file) then MSBuild will create a "sln.cache" file that IS an MSBuild file. When you indicate BuildInParallel you're asking for parallelism in building your Projects. It doesn't cause Task-level parallelism as that would require a task dependency tree and you could get some tricky problems as copies, etc, happened simultaneously. However, Projects DO often have dependency on each other and the SLN file captures that. If you're using a Visual Studio Solution and you've used Project References, you've already given the system enough information to know which projects to build first, and which to wait on. But this an edge case as far as I'm concerned. How does BuildInParallel relate to the MSBuild /m Switch? Certainly, if you've got a lot of projects that are mostly independent of each other, you'll get more speed up than if your solution's dependency graph is just a queue of one project depending on another all the way down the line. In conclusion, BuildInParallel allows the MSBuild task to process the list of projects which were passed to it in a parallel fashion, while /m tells MSBuild how many processes it is allowed to start. If you have multiple cores, you should be using this feature on big builds from the command line and on your build servers. Thanks to Chris Mann and Dan Mosley for their help and corrections. MSBuild Blog - The MSBuild team's blog. MSBuild Sidekick v2 - A visual editor, ala NantPad, for MSBuild files. MSBuild Visualizer - An old project of Mitch Denny's trying to make large MSBuild files easier to visualize. Dammit, changed my mind, now I am going to get a quad-core. Lord, let not this debate continue. As far as a “handful of applications” goes - Scott has this one right, too. My machine is currently running 56 processes totally more than 400 threads! (and that’s without anti-virus crap-ware). Maybe Jeff has a point with the "truely benefit" criteria, but, seriously, who is not writing multi-threaded apps nowadays? Build Time – Always add more power to the dev boxes. It will pay off. Software engineers still cost much more than hardware. This is some pretty cool stuff! Makes the whole '10-minute build' goal of agile projects more feasible for large systems. I have to say I'm surprised that the MSBuild team spent the effort to implement this functionality and didn't implement Task-level parallelism. I haven't played with MSBuild yet, but in NAnt you have the dependency tree already built-in (depending on how you write your scripts), so I would assume MSBuild is similar. If that's the case, I wonder why they didn't add task-level paralellism and let the developer beware of edge cases (cavear emptor)? You can always disable it, after all. Can I assume your single process, dual process, and quad process MSBuild test run times were recorded by doing "MSBuild /t:Clean SharpDevelop.sln" between each test? Not including any development, I typically have at least 6 applications running at the same time, including Firefox (which I use to listen to Pandora), Safari (way, way faster than IE) and IE (crashes less than either of the other 2) all that the same time. All are hogs, especially when they come across a Flash page. I have at least 5 tabs open, if not more, in both IE and Safari. And that's just casual web browsing. It doesn't include what happens when I keep SQL Server running, or do a DNN build, etc. So I really don't buy the minimalistic core argument. It sounds eerily similar to the legendary (mythical?) "'640K is more memory than anyone will ever need". But on the performance question, here's a different one for you: if you wanted better performance, which of the following would you choose? 2) Dual-core processor, 64GB Solid State Drive. Jason - Of course, cleans between each build. Without clean the 4-proc build is subsecond. Hm, I don't trust SSD yet. There's no recovery story and I question the MTBF numbers. That said, I'll probaly jump in on the 2nd gen when it hits 128g, at lease for my C drive. I'll also get a newer processor for the Quad machine. Oh, and my high-end video cards are NOT hooked up in SLI. They run 4 monitors. I don't use it for games. "There are number of things in his post I disagree with." I knew this would happen as soon as I read Jeff's post a few days back - FIGHT FIGHT FIGHT FIGHT! That's a pretty big caveat right there. We had to ditch solution files about 1-1/2 years ago because msbuild couldn't get the dependency tree right, likely due to a size limitation (~200 projects). I suspect that's why other's generate their own msbuild files as well. Ironic that the code bases most in need of scalable build solutions are the ones left high and dry. Dave, can you get me specifics? MSBuild should be able to handle a LOT more than 200 projects. Was this a generated MSBuild from an SLN? If you can get me more details I'll take it to the team. Is the developer that sits inside of VS all day debugging able to take advantage of the same build performance improvements? Andy - Not in VS2008 but I hear a rumor of yes for the next version. Andy asked my question. Kind of silly that there's no way for VS2008 to do this... really kind of upsets me. No one at my company uses MSBuild from a command line like that. If I understand correctly it has to do with that VS doesn't actually "shell out" but I'll try calling it from External Tools and see if that works. This almost received my Holy-Crap-That's-The-Best-Tip-I've-Heard-Ever award. Then Andy had to go and be a kill-joy. Now it's just Thursday again. It "Works" as an external tool from VS...working on more details now. There could be side-effects. With this blog, you have cut by build time by 60%. I'd appreciate that. I'll dig up the details today and get them to you offline. Thanks. Does anyone know how I would apply this (specificyally the /m argument) to a TFS build type? We have slightly modified our build already to provide incremental version numbers, but I'm not familiar enough with the TFS build process to know where MSBuild is kicked off or how to specify new arguments. Scott, if you can figure out how to apply this to normal (CTRL+SHIFT+B) builds, just think of the productivity gains if everyone builds just 10 times a day! It'll be like a little economic stimulus package for the IT industry. 10builds/day * 2 seconds * 1000 developers * 5 work days. That's like 28 extra hours of work being done and I think that's fairly optimistic. Welcome, msbuild, to the 21st century. ;-) GNU make has the -j switch (the equivalent to /m here) _at least_ since the early-to-mid 1990's. We use its mingw port to drive Visual Studio 2003's commandline interface to build vcproj files and to handle dependencies, and since we got multi-core build machines, our build times have improved tremendously (we're talking about roughly 2,5 million SLOCs). For what it's worth, the /m parameter is only available in .NET 3.5 and above. It's funny that I always have to read through the comments to verify that kind of stuff. @Scott, there are still people using VS2005 and .Net 2.0 (our employers are either too cheap to upgrade or we work in non-profit[my case]) So it would be nice for posts like this to clearly denote that these are things only availble in the 3.0/3.5+ world. Or should I just assume that .Net 2.0 is dead? Peter and folks, you CAN build 2.0 projects with this MSBuild so you can get the speed benefits now. Very nice - MSBuild is getting better and better. With 2.0 my build time was about 1:15, with 3.5 single it's down to about one minute, and with the /m parameter (and dual core) I'm down to 40 seconds! Very nice, build times dropped almost in half. I have quad core and dual core desktops and laptops. HANDS DOWN, the quad core systems are SUPER FAST. I never wait for anything on those sysem. Also when encoding files for uploading to live.Silverlight.com, all 4 cores a busy encoding my files. I'll never buy another dual core, ever. Dave - I'll get an update on that bug for you. According to the team: "DevDiv bug #xxxxxx. Dupe of #yyyyyy. There is a workaround, and we will fix it for v.Next at the least." Can anything be done for pre-compiled deployment using the "aspnet_compiler"? Is there a better method to manage code in a secure manner than pre-compiled deployment? Maybe this trick will not work with that trick? MSBUILD : error MSB1001: Unknown switch. I have .NET 3.0 installed. Happens on both my xp workstation and on a 64bit W2K3 system. I really want to take advantage of this feature. Drew, you need .NET 3.5 and you need to make sure you're calling the MSBuild.exe in the 3.5 directory, not the 2.0 one. Thanks, I grabbed the .net 3.5 and tried it and it worked. The switch anyway, my build is nant based calling msbuild tasks, and adding the /m switch didn't have any effect on the overall build time.